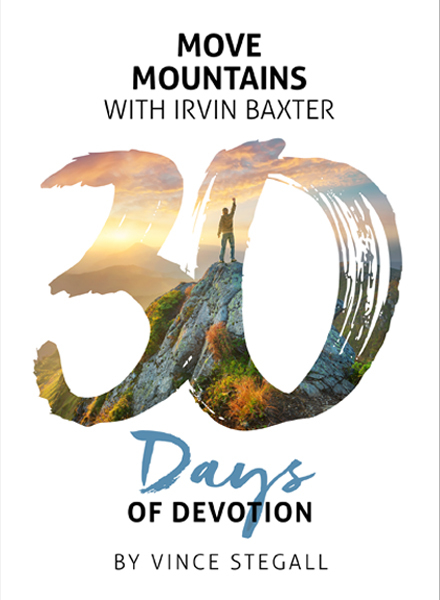 In MOVE MOUNTAINS WITH IRVIN BAXTER, Vince Stegall provides 30 days of devotion that will greatly enhance your connection to God and others. Authentic illustrations from early-morning devotions at the Endtime Ministries headquarters will help you identify areas in your life where you can be more intentional and ultimately discover your purpose. Commit to taking this 30-day journey and experience real-life change as you grow closer in your relationship with Jesus. As a member of the Advisor Team at Endtime Ministries, Vince Stegall leads the web efforts, which include endtime.com, store.endtime.com, and jerusalemprophecycollege.com, as well as, social media, and email campaigns. In addition to leading the web team, Vince has overseen the finances of Endtime since 2016. He has nearly 10 years of experience in organizational leadership, project management, web, email marketing and design, and social media. Vince also has a burden for the local church community. He and his wife, Kaitlyn, have served in pastoral ministry at North Cities in Garland, TX for over a decade, currently as Young Adults Pastors and the Promotions Director. He is enthusiastic, driven, and a self-starter with a passion for leadership and a team approach administratively and in ministry. He graduated with honors from Ohio Christian University with an AA in Christian Ministry, and he graduated with honors from Purpose Institute with an advanced diploma in Ministerial Studies. He and his wife, Kaitlyn, are newly married and reside in Plano, TX.